Murder on the Orient Express is one of Christie’s most famous books, and for good reason. By placing the murder on a train stuck in a snow bank miles away from anything, Christie freshened up her manor house murder scenario, while still maintaining the ‘it must have been someone here!’ vibe for which she is so famous. 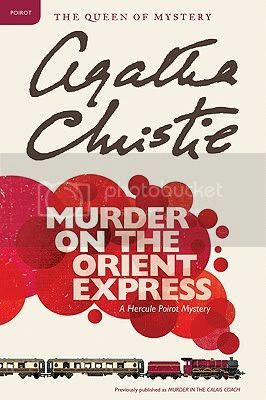 In the midst of a number of Agatha Christie books were I easily solved the murders, Murder on the Orient Express was a refreshing change of pace. This is on par with And Then There Were None for pure brilliance as far as suspect and method of murder, and I’m not sure if I could have ever guessed the culprit, as I have in so many of her books recently. Poirot isn’t typically my favorite Christie protagonist, but Murder on the Orient Express is well worth reading. I’ve only barely scratched the surface of Agatha Christie’s work. I’m starting with the Miss Marple stories and books. I haven’t read any of the Poirot stories yet but I’ll get there eventually. I’m looking forward to this one. This book is so amazing-definitely one of my favorite Christies! I’m so impressed that you’ve been able to solve her mysteries. I think I’ve gotten maybe 2 or 3 out of 20+ read. I’ve never read anything by Agatha Christie. As a whole, are her books on the lighter side? Well, they all involve murders, but they are not remotely grisly. They are sort of the precursor to today’s cozy mysteries, except her series aren’t all set in a donut shop or library, or whatever. Like cozy mysteries they are also quick, easy reads. I have only read And Then There Were None which I loved, this is on my list to try also. Sounds good. This was the firs A. Christie’s books I read! I loved it and I couldn’t imagine who was the murderer! I enjoy a lot these kind of stories! I agree, after And Then There Were None, this is my favorite Christie novel. This is one of my favorite Christie books.